Happy middle of the week!! 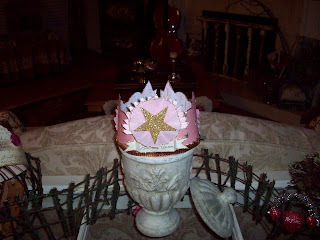 I have been busy making crowns. They are fun to make, but time comsuming. 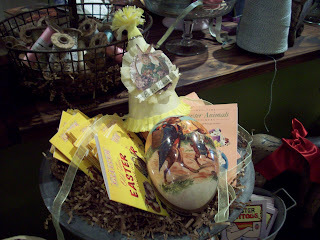 This one is going in Barbara's shop. 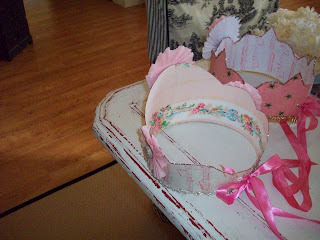 These pretty pink babies are for Jennifer Grey at The Old Painted Cottage. So I got the mess all cleaned up, and now I am going to dinner with my daughter Amanda. My husband went to the Clippers game tonight. 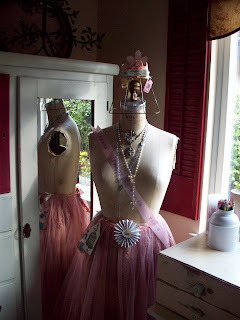 This is what you see as you walk up to her lovely shop. She has the most beautiful plants and pots! This is the enchanting entrance. It is packed with lovelies!! Here is one of the things I brought in. 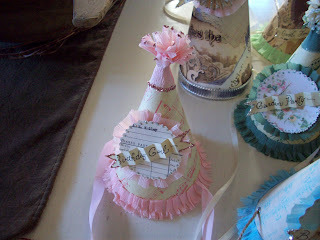 An Easter Party Hat! Remember on Friday, I introduced you to a new blogger, Martha? 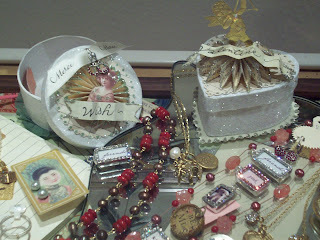 She makes fabulous charms!! 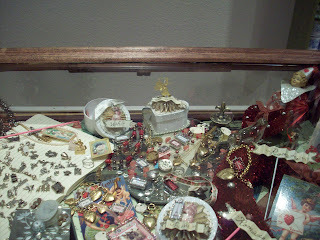 Here are some of her charms, with my boxes. (They go well together) That was yesterday. 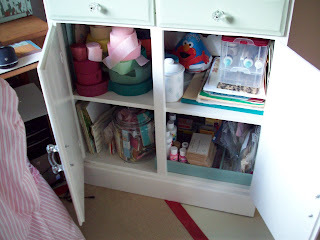 Now for today, I have been organizing my studio/office. 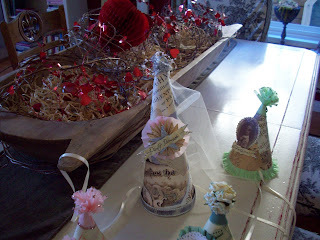 I have been making so much stuff lately, including a big mess. So I finally got around to organizing. 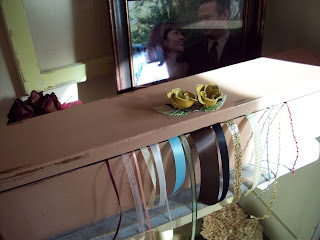 I got this beautiful old box to store my ribbon in. My husband modified the inside for me. 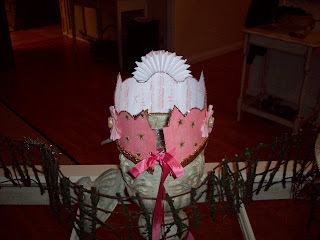 Here is Isabella, with her new lampshade wire head. Remember my $10 hutch from last summer? Here it is again all organized and ready for me to get to work. 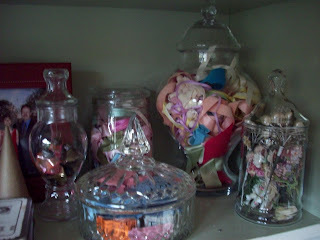 Some of my jars of pretties. So that is what I have been up to this weekend. It's raining again! Update for Monday, I got a comment from a Janie. She asked how to purchase some of my art pieces. Janie didn't leave a blog name or email, so I can't contact her.If you know Janie, or if you are Janie, my email address is on my blog. 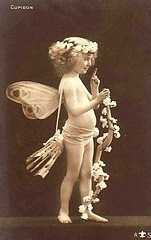 Charming Cupids And A New Blogger!!! Hope you are all having a great afternoon/evening. 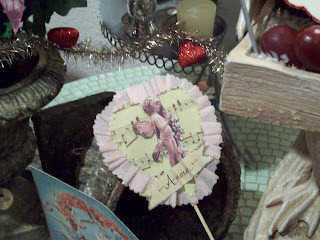 Thought you might like to see these charming little cupids I found. 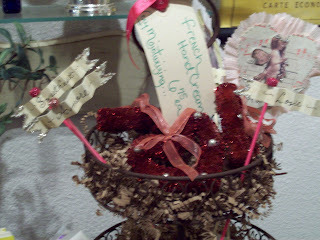 Valentine's Day is on it's way. meet a new friend. She is new to blogging and I wanted you all to meet Martha. 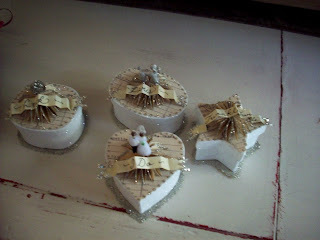 She also sells from the same little shop that carries my paper art, and boxes. Garden Memories. 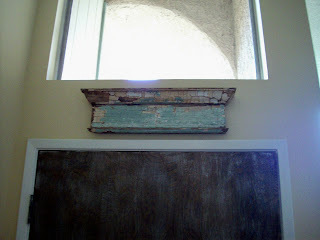 Please visit Martha's new blog when you have a chance. She has a great post today about mermaids. 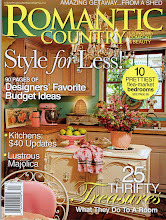 I hope you all welcome her into our wonderful blogland. Random Facts and Random Pictures!! Happy Middle of the week to all! Today it's still gloomy outside, even in sunny California. I took some random shots around my house. 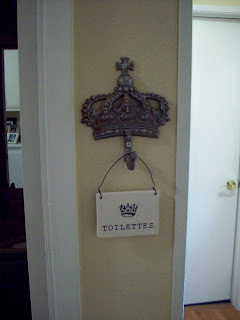 Here is my crown hanging outside the guest bath. This lovely chippy header, I got from Ebay. I just love the color. 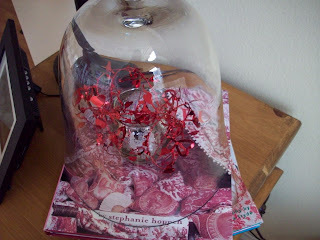 I change this cloche with the seasons and holidays. 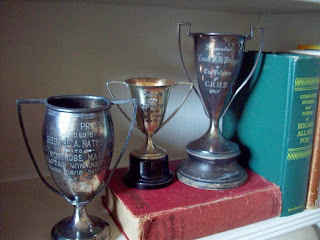 I started a small collection of vintage loving cups. I think they add charm. 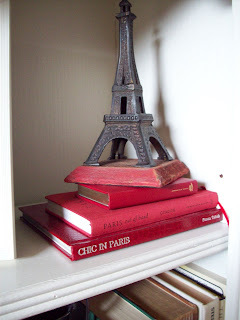 My other mini obsession is with France. I am still trying to get brave enough to fly there. 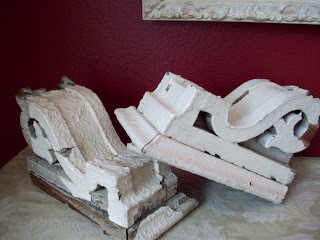 I love these old chippy corbels. They look especially good in front of my red wall. OK, now for more boxes, and news that I forgot to mention in my last post. 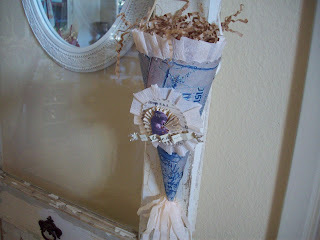 Jennifer Grey is now carrying a line of pretty paper items, including some of my paper art. 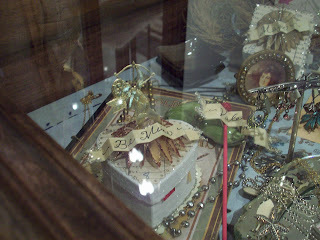 She has boxes, cones, mini banners, and many other items from many different artists, you will love. 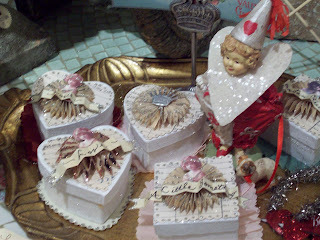 www.theoldpaintedcottage.com/ Check out her new category called Paper Post. Now in my last post I was tagged, and I had to tell 5 random facts about myself. I did that, and asked when you all posted a comment to leave a fact about yourself as well. Here is what some of you said. Deb, My daughter Kate and I are often referred to as the Gilmore Girls. Best friends and that's who we look like." Jenn," My aunt got me interested in antique tea cups. Each person always got a different cup." Liz, "I never go anywhere without mascara and eyeliner on." Karla, "I love boy bands." Pat ,"I have useless trivia floating around in my head, especially about old movies." Junie, If on a desert island, I would want every book ever printed." Linda, " I love fresh flowers, and always have one on my nightstand." Kimberly, I love eating Lays potato chips and green onion dip, lots!" Michelle, " As a teenager I wrote fantasy stories about leading a double life." Thanks for all of your random facts, and for playing along. It was fun! I said awhile back I would show more wedding pictures to you. Well I thought I would post one today of my daughter's smiling face. 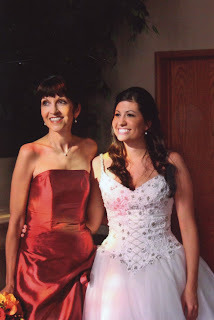 (and mine) For those of you who don't know, she was married in late October. This is how she looked the entire day. She never stopped smiling. That is all one can ask for on their wedding day. 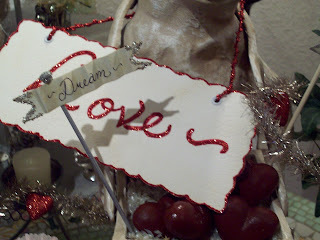 I thought I would post this , frankly because I am busy working on my paper art today. I do not have any time today for new pictures. I hope this one makes everyone smile. 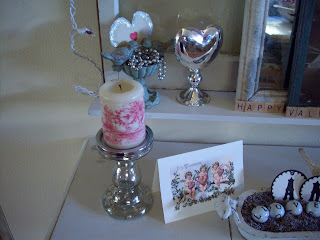 Now I was tagged this morning by Becky, from Sweet Cottage Dreams http://www.sweetcottagedreams.blogspot.com/, you know the drill, 5 random facts about yourself. Now I have done this before, so I am trying to come up with more random facts that you haven't heard before. night dinner. Just like the Gilmore Girls, well almost. Now I am suppose to tag 5 more people. This is tricky, because I can't remember who I tagged last time. I thought of an idea. If you leave a comment, could you put 1 random fact about yourself? I would love the entertainment. Then I will post some your facts on my next post, so people can read them. That would be fun!!! Have a great Monday, and keep smiling. Before I forget again, I was given this award awhile back. I have been so busy lately that I forgot to mention it. Thank you all!! I know you are suppose to pass awards on the next person or two. I think you are all make my day. I love reading your blogs everyday. 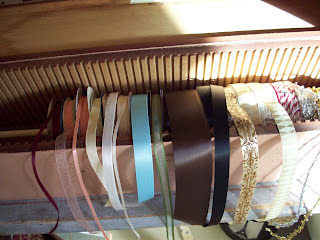 There is one blog that comes to mind, if you haven't been there, you must go. 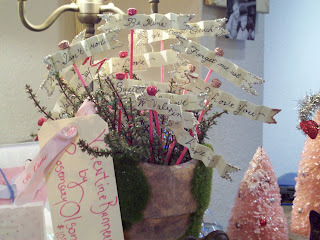 Poppy and Ivy www.amyhollands.typepad.com/ She has a beautiful new shop, but it's her writing that is so witty and smart. It's like reading a funny little book. I think you will enjoy her writing. So I am passing this one on to her. 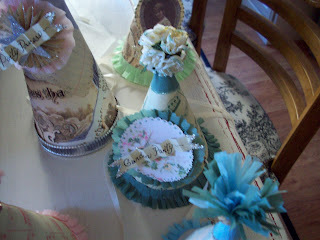 Here is a little bit of what I have been working on this week. A friend of mine asked me to make her some cones. She wanted some samples to take with her on a trip she is taking. She thinks a lady she knows will be interested in some for her shop. Now for the party hats. This is the first time I have tried party hats. My friend Barbara asked me to make some, so I tried it, and this is what I came up with so far. 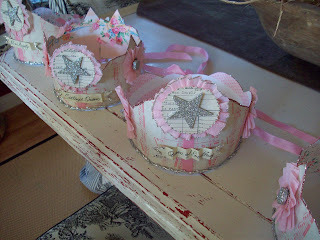 I wanted to make some crowns this week as well, but these party hats took up a lot of time. I like detail, so it takes awhile, but with pretty good results. Well I hope you enjoyed my arts and crafts hour, now I need to go do some cleaning. I have made quite a mess this week. Hope you are all having a nice Tuesday evening!! It seems like only yesterday we were packing away our Christmas. Now the next holiday is on the horizon. 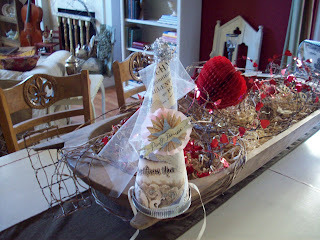 Here are a few views of my Valentine decorating. 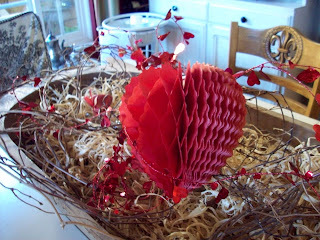 I picked up this crepe paper heart at the Rose Bowl for .50cents. 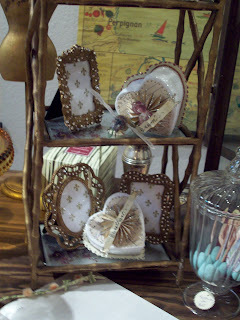 Don't you just love all things romantic? 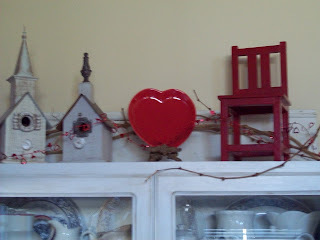 Red heart plate came from Home goods. 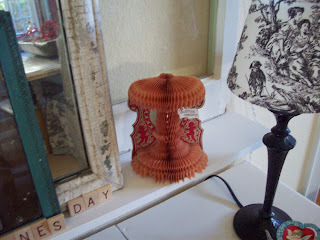 I like it next to my little red chair. 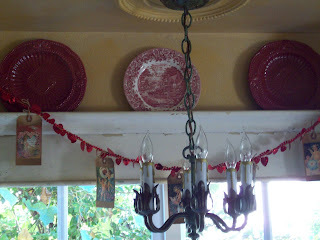 This is the valance in my kitchen. I constantly change it for the seasons, or holidays. 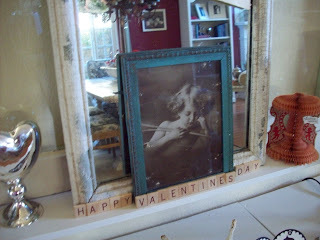 I got this cupid asleep photo last year on Ebay!! 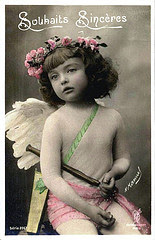 This cute Victorian Valentine is so pretty. 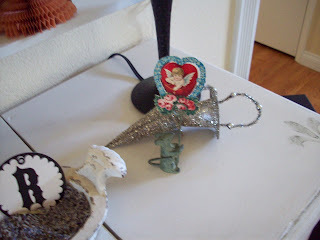 It opens up to reveal the red cupids. The crepe paper is still in tact. Amazing!! 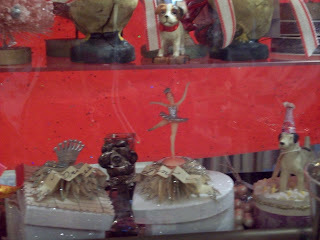 It also came from the Rose Bowl Flea Market. I have this little mouse, and depending on the holiday, he is always holding something different. Words are a favorite of mine. 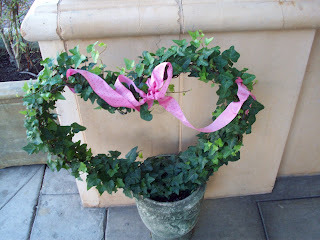 Are you decorating for Valentine's Day yet? Well, I better get back to work. 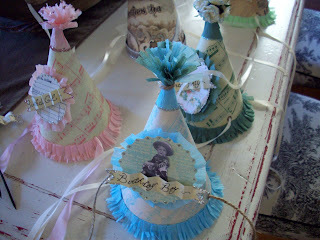 I am creating some party hats this week, for my friend Barbara. 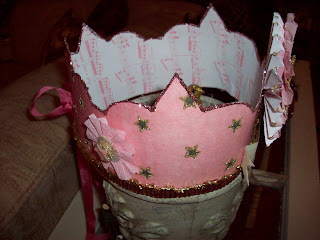 I am also making another crown or two. I will let you know how they turn out. 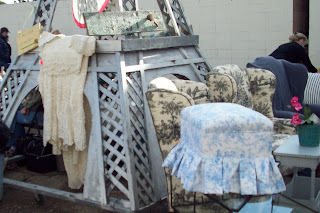 Here are a couple of views of the Paris Flea Market in Carpinteria. It was a lovely morning. Very warm for this time of year. 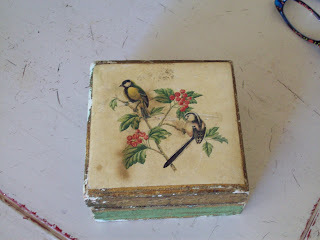 I bought this pretty old box made in Italy. It just called to me. 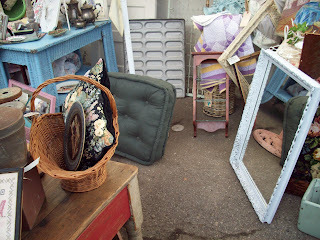 I know you love to know the prices at flea markets. The lady had it marked at $19, but let me have it for $10. 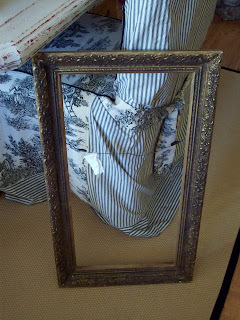 I got this great old frame for $10 as well. Not sure what I will do with it yet, but I see future project. 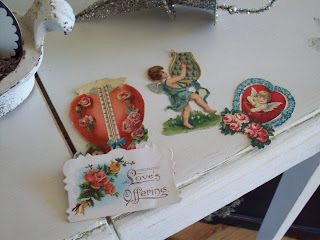 We also stopped into one of my favorite little antique shops while we were in Carpinteria, and I picked up these cute Victorian Valentines. 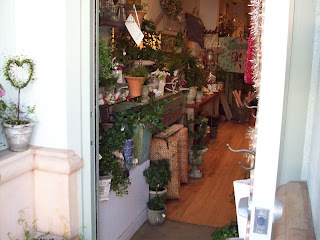 Next stop of the day, Garden Memories in Ventura, where I dropped off more goodies I made for Barbara. Mark and I went to have lunch, and when I came back Barbara had set up my pretties so cute, I just had to take pictures to show you. By the way, Barbara just had her first grand baby. Congrats Barbara!!! He is adorable. 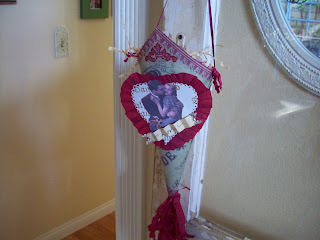 Some banners and a cupid pick. 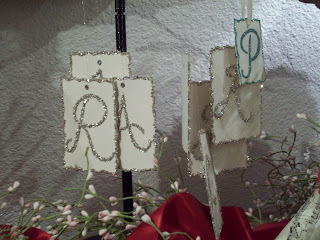 Some glittery initials. More boxes. One of my signs, and banner/flags. My boxes right next to a Cody Foster box. Now Mark and I are off to a neighbor's get together. I hope you are having a fun weekend! Up To My Elbows In Glitter!!! 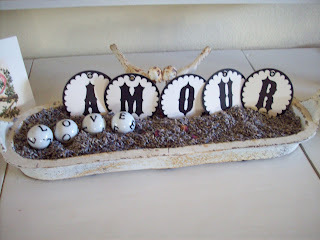 Nests and Birds, Birds and Nests! !